There are two things I'm not supposed to say today: 1) I don't like Stranger Things, and 2) You shouldn't buy my book The Exiled Monk. The Netflix show Stranger Things is incredibly popular right now. My social media feeds are filling up with praise and delight for the show. But I don't really like it. I'm not supposed to say that, though. It's unpopular to have an unpopular opinion. I'm supposed to like what other people in my friend-group like. And if I don't then I'm clearly wrong. Too many people like it for it to be bad so I must be wrong for not liking it. Right? Or so the logic goes. For some reason (about which I have some theories) we've decided that there should be one objective preference that everyone must abide by. I know it helps us to create groups of like-minded people. I know it helps us to know, in general, if we'll like other things that the people in our group like. I know that it feels good to enjoy the same things as other people. But it also feels terrible to be on the outside looking in when the conditions for inclusion are whether or not you prefer a certain show or movie or book (also I've never read Harry Potter). And that's why you shouldn't buy my book. Or rather it's the very reason I don't want you to buy my book. I don't want you to buy The Exiled Monk because you know me. I don't want you to read it because you think it'll make me happy. I especially don't want you to review it positively because of that. What I want for you is what I want for me: the freedom to choose what we prefer and to like what we like. On paper I should like Stranger Things. I fit all of the demographic markers for someone who should love the show. I grew up in the 1980s as a geeky kid who was way more into books and video games than sports and girls. I'm still into a lot of geeky stuff (I subscribe to YouTube channels about astrophysics and forging fantasy weapons). 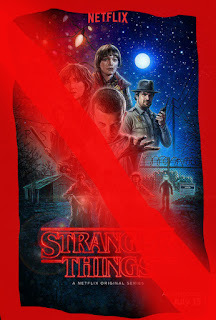 I like a lot of the same things that overlap with Stranger Things, but I don't like the show. It's okay. It's not bad. I just don't like it. And that's okay! Both the creation of art and the enjoyment of it are intensely personal experiences. To try to normalize them across a group or to use the enjoyment of a particular piece of art as an identity marker is to miss the uniqueness of each piece of art and every person's appreciation of it. I really want you to love The Exiled Monk as much as I do. It's precious to me. But it's also a piece of art. It might not resonate with you. That's okay. I won't be offended. I would be offended if you pretended to like it. If you told me it was good but really thought it was boring. Please don't do that. You don't have to like it to like me, or even to like my writing. I'll write something different next (because I can't seem to help myself). You can come back to see if that works for you. The Exiled Monk is nothing like Like Mind which are both nothing like the project I'm working on right now (hint: Tinker Bell meets Fight Club). But if you do like it (*squee*)... Well, that would make me exceedingly happy (*jumping-up-and-down*). I wrote this story because I love it, but I published it because I think that it might be something you could love too. If you do, please let me know. Let others know by leaving a review. They might love it too. Or they might not, and that's okay.